Our classic cappuccino with an unsweetened taste (1). Crafted using natural high quality coffee beans. Made with fresh milk sourced from British dairy farmers. Every cup has a delicious velvety froth. 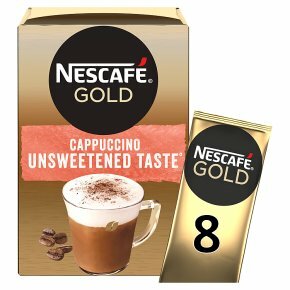 8 unsweetened taste instant cappuccino sachets (1) to enjoy at home. (1) Low sugar when prepared for an unsweetened taste.When you fancy a cappuccino with a less sweet taste, sit back and enjoy a NESCAFÉ GOLD Cappuccino Unsweetened Taste. Savour the flavour and aroma of this delicious coffee at any time of the day.